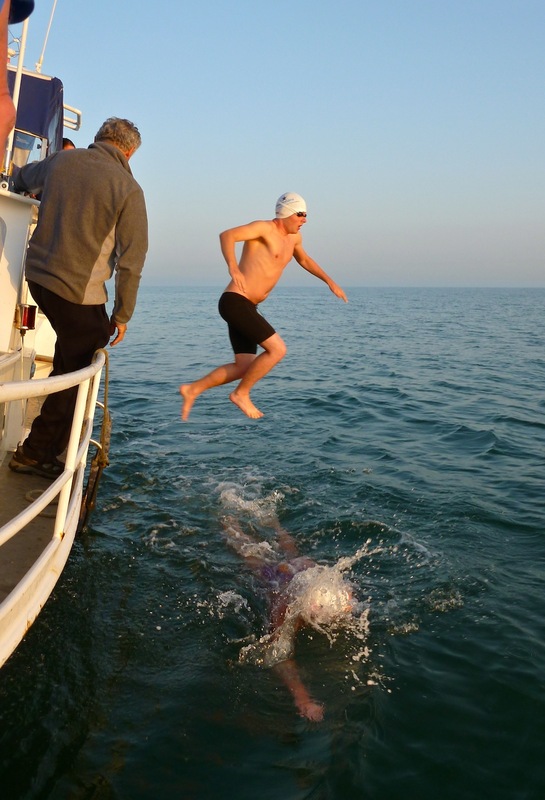 After a reasonable enough waiting time of 5 days in Dover, our pilot Mike Oram told us that Saturday, 13 July would be the best day to attempt the swim. We were to meet him at Dover Marina at midnight with the aim of starting some time between 1:00 am and 1:30 am. At the marina we met Mike and his crew as well as our two CS&PF-appinted observers, Mike Ball and Jim Boucher. Once all of the gear was onboard and Mike and Carol had their “discussion” on the team’s speed and targets, we set off for the start point at Abbot’s Cliff on the western end of Samphire Hoe, the same spot where I started my solo. 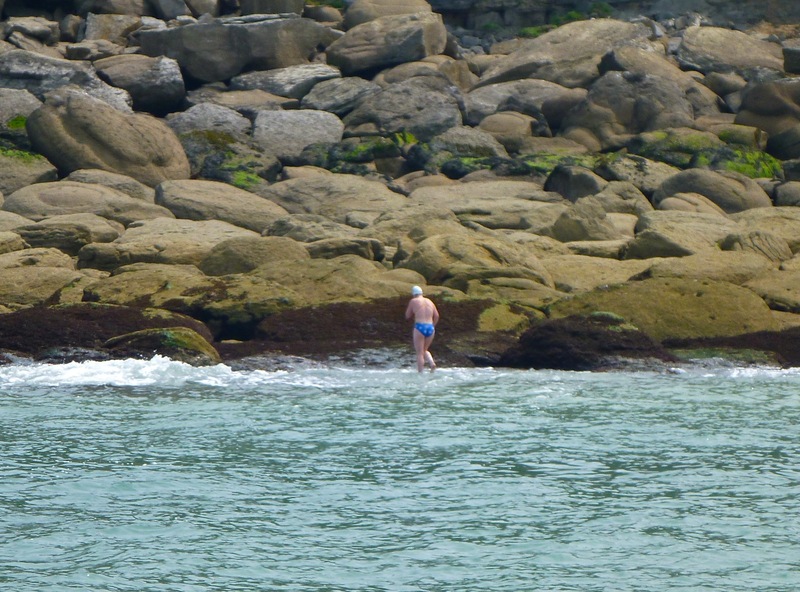 As per the carefully considered plan, Carol was the first swimmer in the rotation and so she had to go ashore at the start point to officially start the swim. 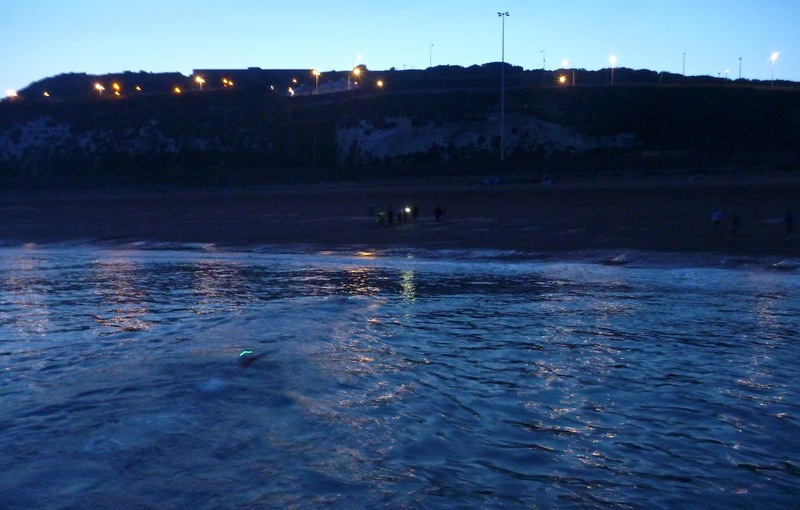 Mike shone the torch onto the beach, at which point a fox scampered back to the cliffs, Carol jumped in and swam to the illuminated patch of shoreline, where she cleared the water and signaled that she was ready. At 1:14 am, the siren sounded and Carol began swimming her hour. Carol swam about 3.9 km in her first hour, just above our target speed of 3.6-3.8 km/h. I started to get ready after about 35 minutes, this was too early, and had a bottle of High5 Zero electrolyte drink and a High5 gel. The gel was a bad idea as it tasted rotten and upset my stomach during my swim. A slight goggle malfunction was irritating me also but none-the-less I got through the hour, my only night swim of the crossing. Caitlin swam the third hour, by the end of which it was starting to get a bit brighter, and Lynne swam the fourth hour. By the end of the fourth hour, about 4:14 am, it was officially day-time. Maeve and Eoin were delighted that they didn’t have to swim in the dark! 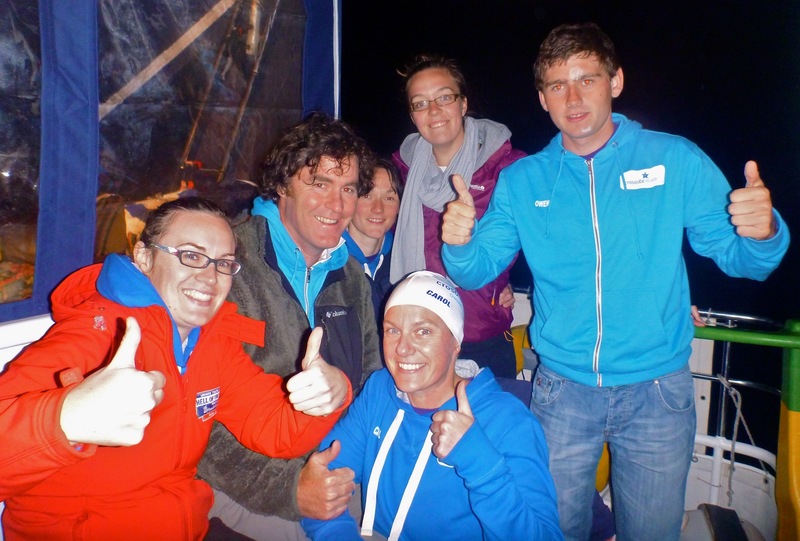 During Maeve’s first hour (4:14 am to 5:14 am), she caught up with and passed Neil Streeter’s “Suva”, which was escorting Australian swimmer, Libby O’Farrell. The two boats passed very close! About 5 hours later, Caitlin was back in the water for her second hour and passed Lance Oram’s “Sea Satin”, the boat from which I did my solo, which was escorting Rachel Hessom. 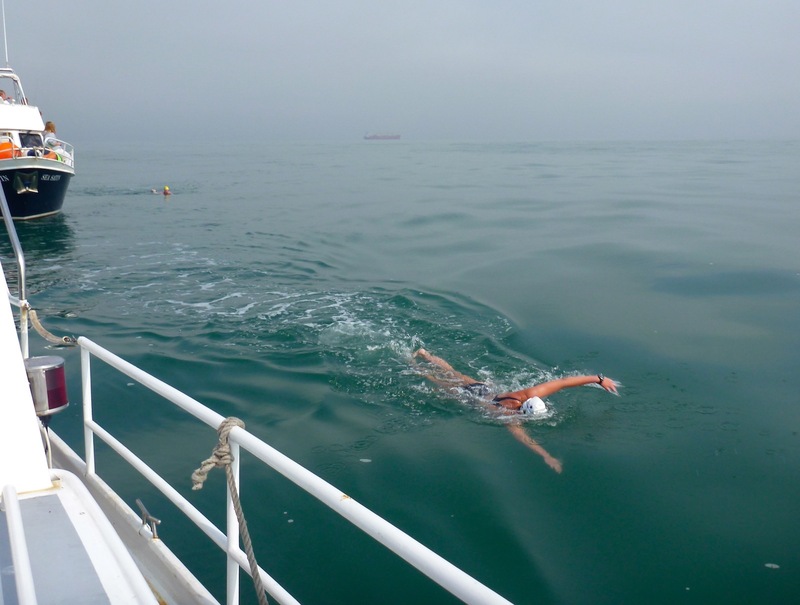 Rachel was swimming the Channel as part of her Arch-to-Arc challenge, in which athletes run from Marble Arch in London to Dover, swim across the Channel (usually in a wetsuit but Rachel was going without) and cycle from their landing spot to l’Arc de Triomphe in Paris. Both Libby and Rachel were successful in their swims that day. The return leg was pretty uneventful for the most part. Conditions remained near-perfect and we were able to get some sleep as well as stuff our faces with ginger nut biscuits between our swims. During the eighteenth hour, the pilot asked for some serious power for the rest of the swim. If the likely last three swimmers (Carol, myself and Caitlin) swam fast enough we would both break the record and land at Shakespeare Beach, an ideal landing spot. Once Eoin had swum the eighteenth hour, Carol jumped in and sprinted off – she was hitting up to 80 strokes per minute during her hour! This was bringing us closer and closer to England and the White Cliffs of Dover were becoming more visible. We needed to keep up this pace so the pressure was on for me to give a “power hour” as Mike calls it. I leaped over Carol at 19 hours and bolted off, kicking hard. The SiS caffeine gel that I took before the swim was working – I was able to hold the sprint – and the carbohydrate drink was helping to sustain my speed. I kept as close to the boat as possible, where I would gain some assistance from the boat’s drag – a trick I learned from watching Trent Grimsey during his world record-breaking swim last year. Still, I was really hurting from about half an hour in. I was managing to hold about 80 strokes per minute also but every one was beginning to hurt. I got comfort from seeing Lisa hold up an orange jacket every 10 minutes during the hour, though. Some noise from everyone else on the boat was greatly appreciated also! As the sun went down I was waiting to see one of the crew put the ladder in position and Caitlin get ready to takeover, but it seemed to take longer than on my first three swims. Eventually, Caitlin did appear at the gate in her togs but, as far as I was concerned, took forever to jump in. When she did, I was incredibly relieved. Catching the ladder was a struggle but I caught it eventually, my hip cramping as I did so. We were so close at this stage, it was time to give Caitlin plenty of vocal and visual encouragement to get into the beach. Caitlin did a great job of bringing us into Shakespeare Beach, where we swam the other day. When the boat couldn’t go any closer, Carol jumped in with her waterproof camera to take a few shots at the finish. Caitlin cleared the water 10 hours 10 minutes and 1 second after we left France, giving us a total time of 20 hours 29 minutes for the 2-way. Needless to say, there was great jubilation on the boat and plenty of patting each other on the back for a job well done. On the beach, Caitlin was greeted by her dad, Derry, as well as Maeve’s fiancé, Martin, and Lynne’s husband, Richie. The three lads deserve great thanks for putting up with us for the whole week and Derry deserves a special thanks for his great cooking, approved of by athletes! Writing upside-down on a ceiling after a 2-way Channel relay is not so easy so Carol and I ended up sharing the writing! The spot that we were allocated was next to that of Nick Caine, a swimmer my own age from California who swam at the Cork Distance Week in 2009 and swam the Channel that year also. Next to our spot, I also wrote in Pádraig Mallon’s swim. 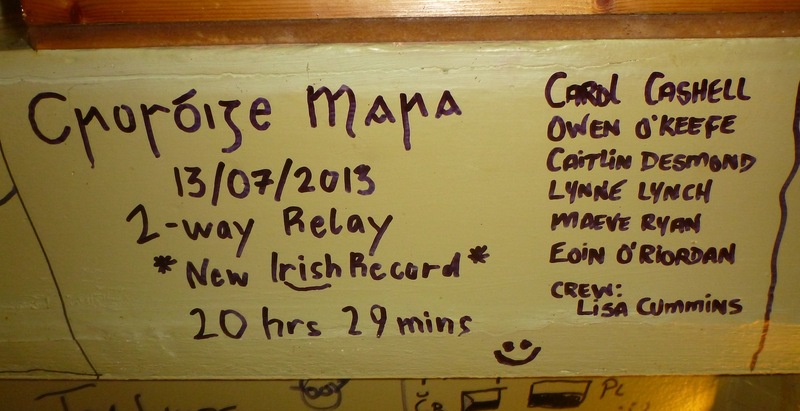 Pádraig is from Newry in Northern Ireland and swam the Channel on 6 July in a time of 14 hours 47 minutes. Our chart as produced by Gallivant’s technology. We have loads more photographs from the swim than the ones in this post. 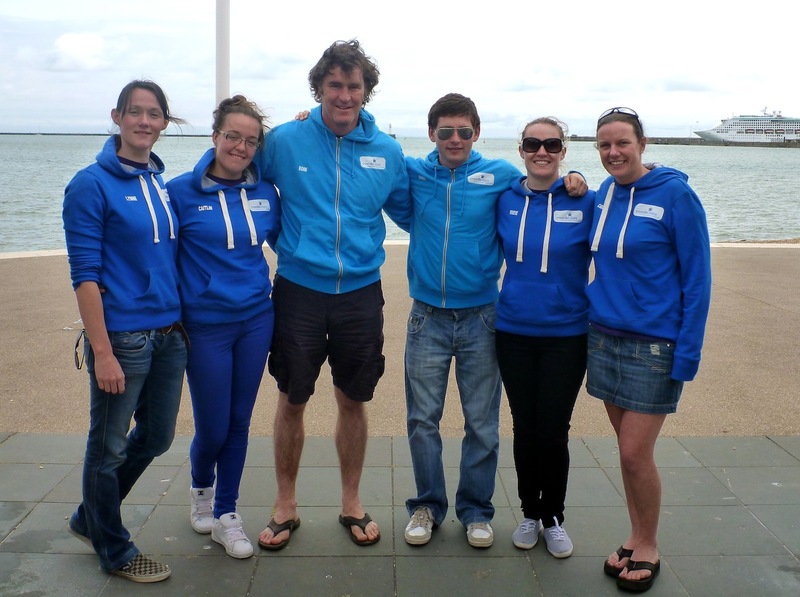 Keep an eye on our Facebook page to see all of the photographs from the swim and our few days in Dover. Don’t forget also that we’re trying to raise €10,000 for Down Syndrome Ireland through the swim – you can support this cause by going to our iDonate page and clicking on “Sponsor Me”. All donations are greatly appreciated. Thanks to everyone for their support on Twitter and Facebook during the swim! Good news! 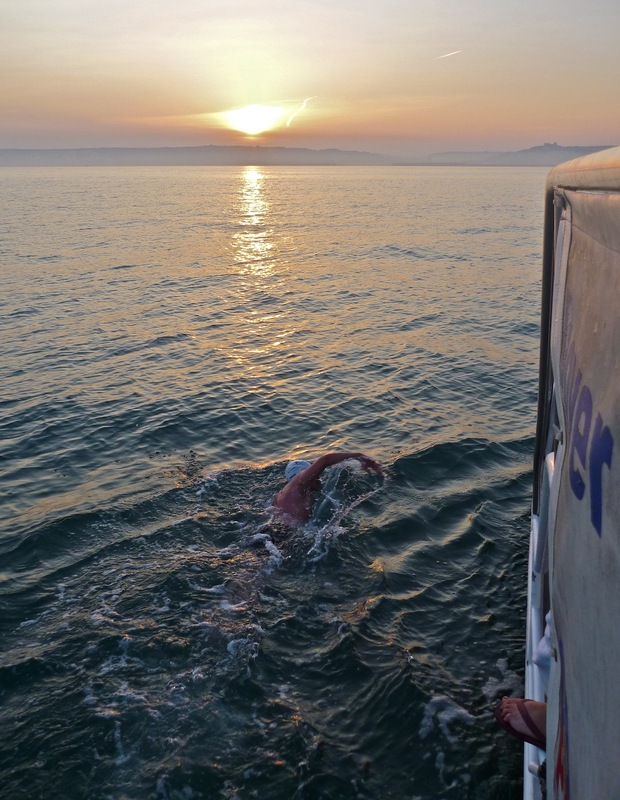 The pilot for our 2-way English Channel relay, Mike Oram, called this morning to confirm that we will be meeting him in Dover Marina at midnight tonight with a view to starting our swim for about 1:00 am tomorrow. We’re all packed now and ready to go! We are doing the swim in aid Down Syndrome Ireland, a very worthy cause, and if you’d like to sponsor us just go to our iDonate page and click “Sponsor Me”. Any support is greatly appreciated by all of the team! I started the swim at 7:00 am on the Saturday morning. 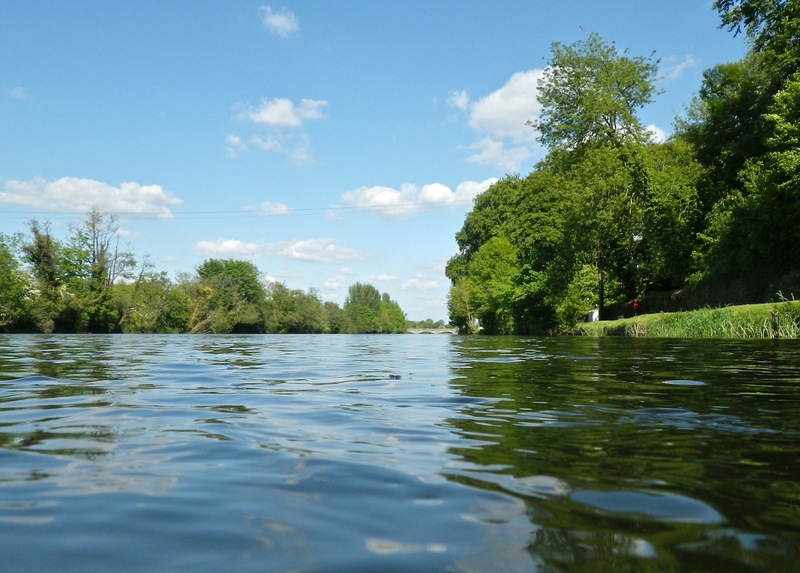 It was very dull and a bit cool, but the water was still about 15ºC so that was good news! 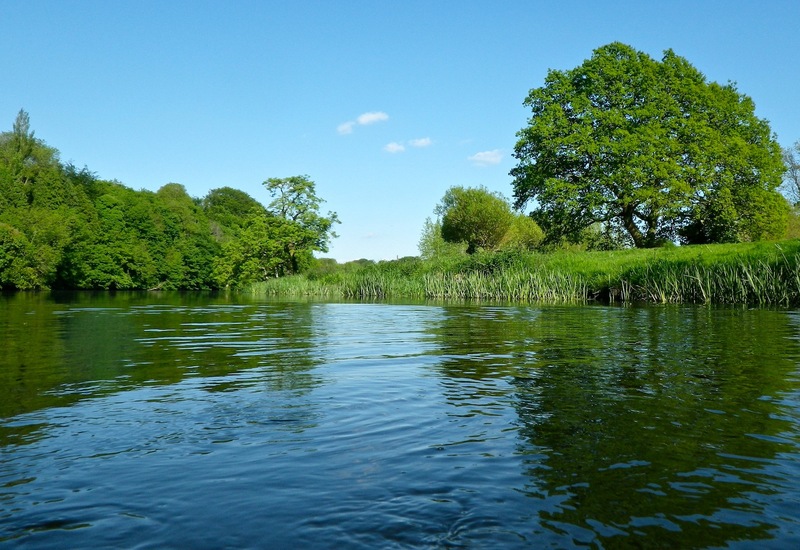 I was swimming upriver to various points on the bank and then back down for my feeds. I got a but cold during the second hour but this soon passed – no harm to get that phase out of the way early in the swim! 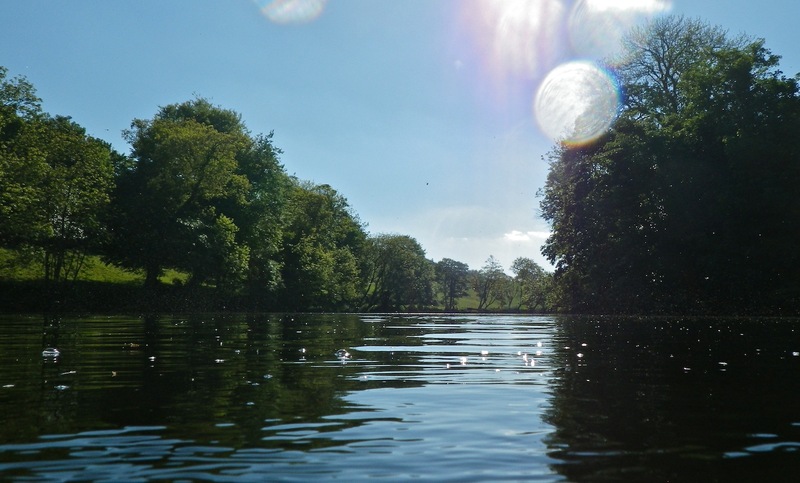 After about 2 hours, Dave Mulcahy joined me and swam to Glenabo Stream and back, taking about 1 hour 30 minutes. After just over 4 hours I switched from 30 minute intervals to 20 minute intervals as planned. This made the last 2 hours seem a bit quicker. The fact that my belongings were stolen caused me great upset. Somebody had obviously meticulously searched through the bag for their target items, i.e. clothes and cash, and left what was on little use to them. For the last 48 hours my major concern has been my missing keys, which included keys to the front door of my own house and my grandfather’s house, as well as keys to the side gates of my house, my bike lock and, most importantly of all, my father’s car. Luckily, I just this minute found that the thief had taken the keys out of the pocket of my tracksuit pants and hidden them in an unused side-pocket of my gear bag. To be honest, I don’t care about the clothes or the small change that I’m not going to get back, I’m just relieved to have my keys and some sense of security back. On the other hand, this could have been a very serious safety issue. It was a Saturday so there were no construction workers in the area and the Rowing Club were all away at a regatta, and had the weather been bad, there wouldn’t have been anyone around when I finished the swim. I was in the water for just over 6 hours and could have been very cold when I exited. I could have been hypothermic upon exiting without any means of getting assistance. If it came to it, I’d have had to walk into town in my togs – not an ideal situation, as you can imagine. So, I would appeal to anyone engaged in theft to think not just about the monetary/sentimental value of what you’re stealing or the upset that you are causing to the person that you’re stealing from, but about the very real danger in which you’re putting their life if you’re they happen to be swimming at the time. At the start of my 2-hour qualifying swim; view of the Bridge obscured by the sheet piling of the flood protection works. 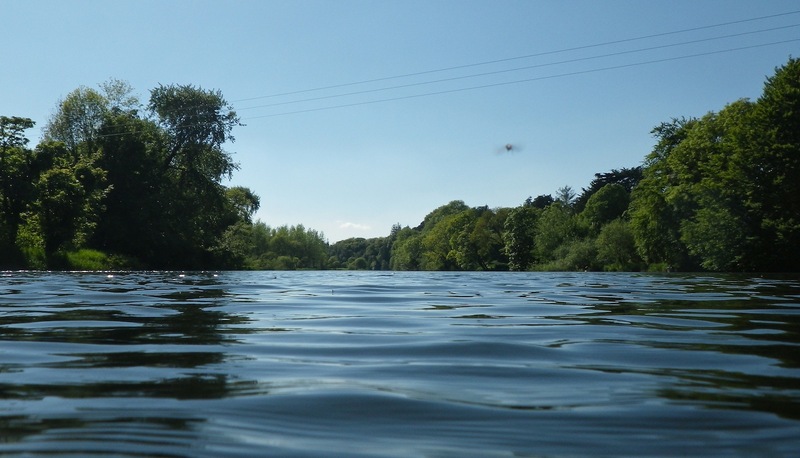 From the new slipway, looking upriver where I did most of my swim. Strange to see blue sky! Looking back down Barnane from the 400 m mark. Just after fighting the rapids, 2 km upstream from the start, the long straight stretch to Castlehyde just around the corner. I turned back here for safety reasons as it’s out of public view (though it shouldn’t be). The trees (right) marking the end of the Third Field. 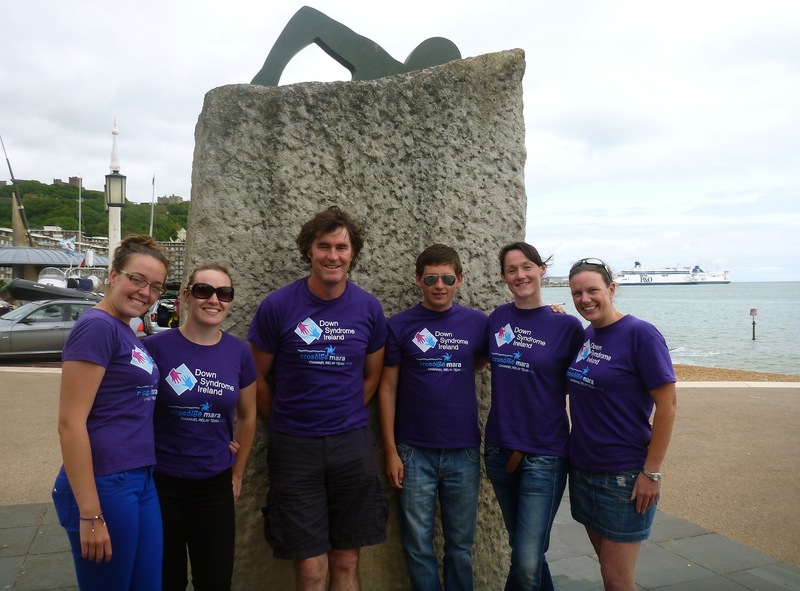 This is the point at which swimmers will turn around during the Martin Duggan Memorial Swim on Friday, 14 June 2013. Why wouldn’t you want to swim here? Looking towards Barnane from the 700 m mark, the house “Innisfallen” between the trees. 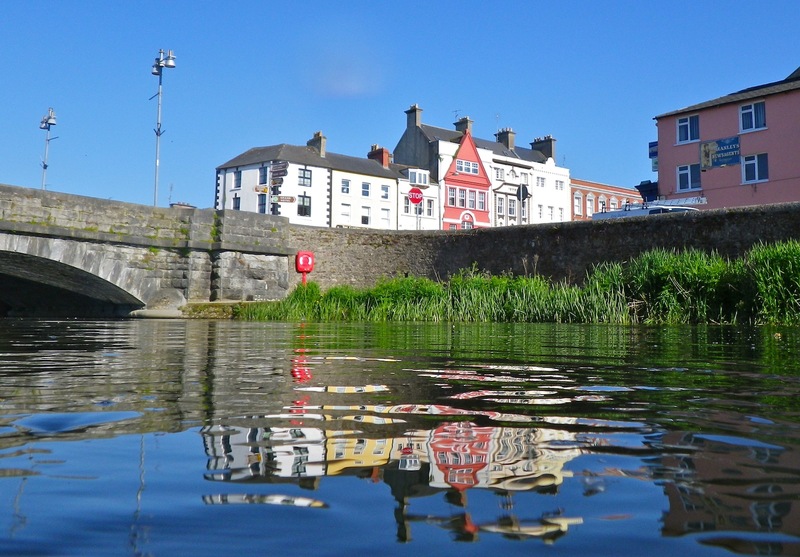 Buildings in Pearse Square, Fermoy as seen from the Blackwater. 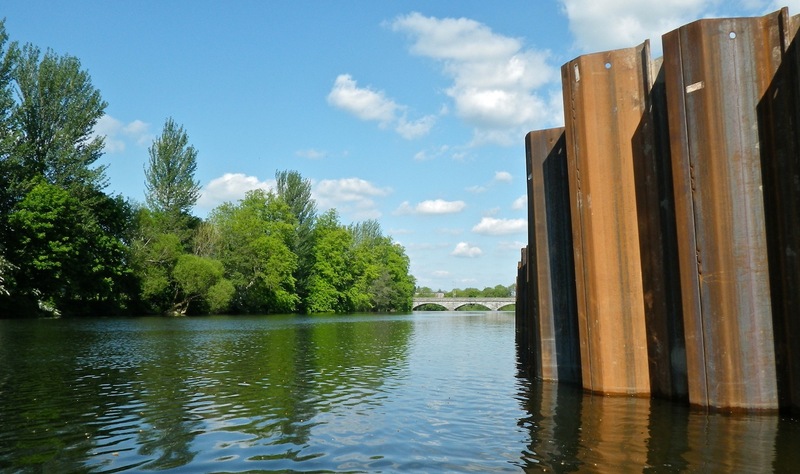 Fermoy Bridge as seen from the water. Measured by my FINIS Hydro Tracker GPS, the total distance for the swim was 7.12 km and it took me 2 hours 10 minutes to complete (a bit slow I know but I was taking a good few photographs). 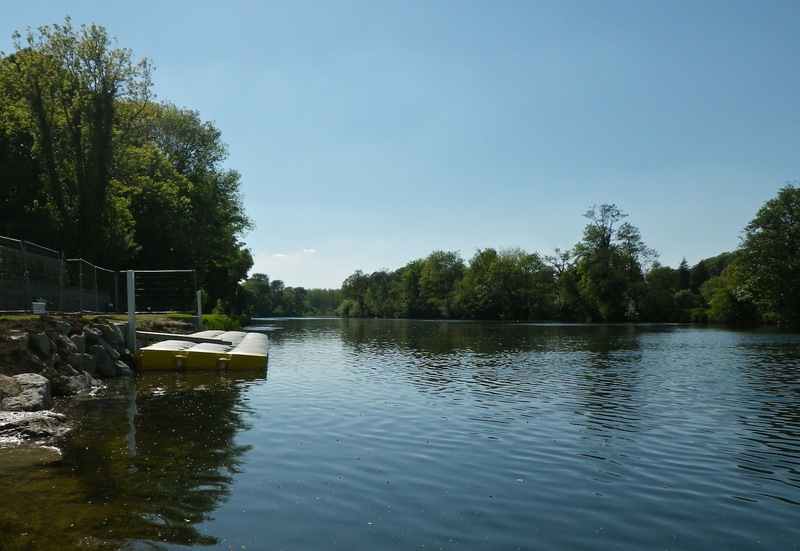 The water temperature was about 14ºC but the air temperature was very warm with unbroken sunshine! It’s great to have the official 2-hour swim out of the way but I still have my 6-hour qualifier for Jersey to complete (fun). 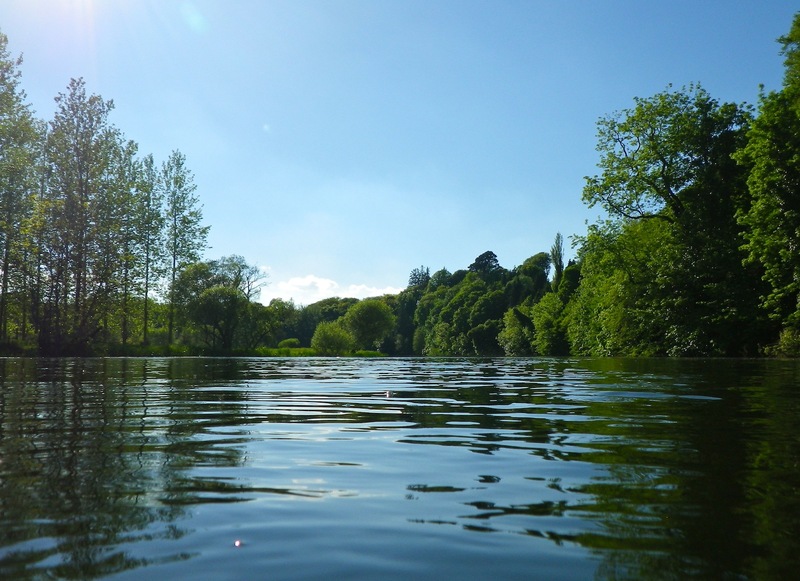 I hope enjoyed the pictures, even though it seems like a lazy way of posting… Don’t forget that entries are open for the Martin Duggan Memorial Swim on Friday, 14 June 2013 at this great location. That’s just two weeks away so it’s time to start entering! It’s a fairly quiet week and, to be honest, I can’t think of anything to write about. So to fill the gap, and maybe to put some pressure on myself, here’s a quick summary of my main goals for the 2013 season. Assuming that the race is run under the same tidal conditions as it was last year, I’d love to complete the “Vibes & Scribes” Lee Swim in under 24 minutes. In theory, the swim is 2 km, though there is sometimes a little tidal assistance. I came a reasonably respectable 3rd with a time of 24:07.5 last year – I didn’t do a whole lot of training last year so I should be able to improve on this. The day after the Lee Swim, I’m heading to Dover with Crosóige Mara for our 2-way English Channel relay attempt in aid of Down Syndrome Ireland. 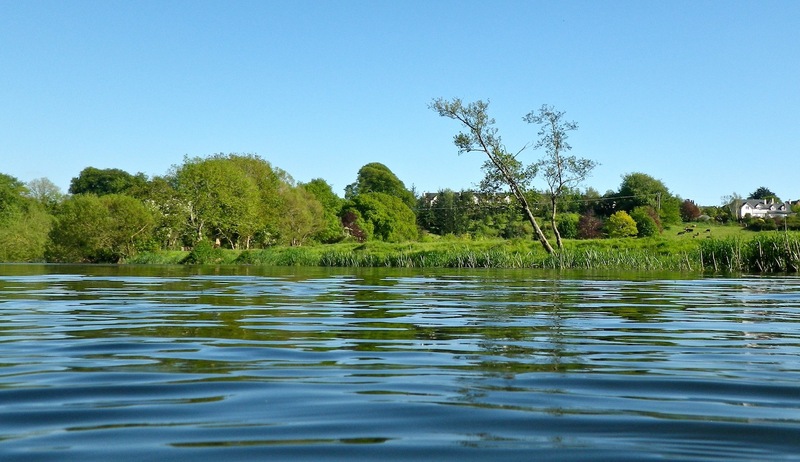 Most of us on the team swim at about 4 km/h in the open water so we are hoping to complete the swim in 24 hours (or under) and, in doing so, break the Irish 2-way relay record of 24 hours 4 minutes. I’m really looking forward to this! 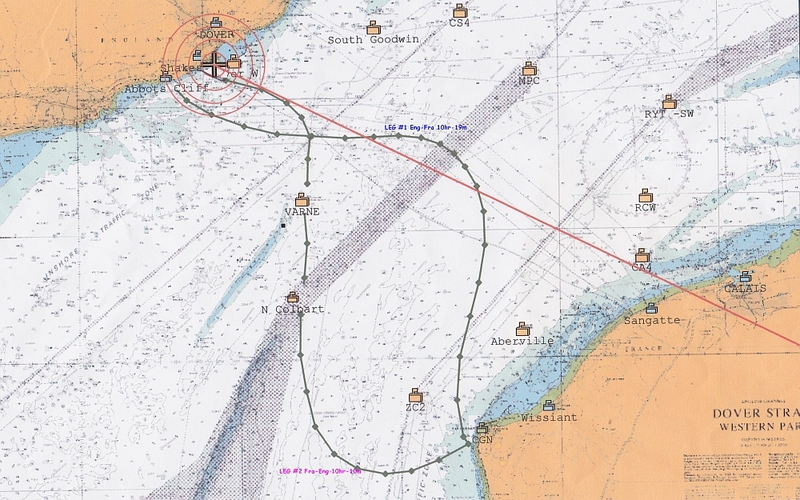 While the rest of the team head home after the relay, I will stay in London to wait for a call to go to Jersey for my solo circumnavigation attempt. The Round Jersey swim is, technically, a 65 km swim. However, the swim is heavily tide assisted and a lot of swimmers tend to get faster times for this swim than they do for their English Channel swims. 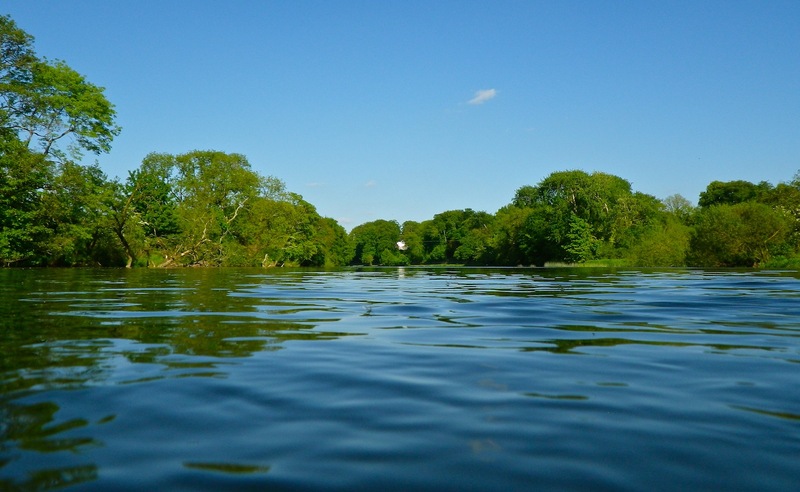 I’m hoping to complete the swim in under 10 hours – and beat Ned‘s time! I might have one or two other long swims lined up for August but nothing’s confirmed yet. In September, I plan to do my first overseas race, the 6.5 km Marnaton series swim in Cadaqués, Northern Catalonia. I speak virtually no Spanish and even less Catalan, so thankfully, Mauricio and the gang from OWSwimming.com have offered to translate all of the race instructions for me! When: 21:00 on Saturday, 29th December to 05:00 on Sunday, 30th December. Where: Mayfield Sports Complex, Cork (Northside). Price: €20 for any 2 hours or €50 for the entire 8 hours. Down Syndrome Ireland – providing information, advice and a voice for people with Down syndrome and their parents/guardians across Ireland. You can follow Crosóige Mara on Twitter @CrosoigeMara and you can donate online through our iDonate page. Thanks to everyone for their support so far!